DJI has set an incredible pace for releasing products in the past two years. Just one year ago, in early 2016, they were offering the Phantom 3 series of drones to happy customers who were impressed and using them for many applications, including video production. Flash forward one year and DJI has released four new quadcopters, giving drone pilots many options for different types of flying. First, they released the Phantom 4 last spring. Next came the DJI Mavic Pro in the fall, and then, toward the end of the year, they released the Phantom 4 Professional and the DJI Inspire 2. These last two are geared toward professional cinematographers and this review is specific to the Phantom 4 Professional. The Phantom 4 Professional is a game changer. It features an upgraded camera with a 1-inch 20-megapixel sensor capable of shooting 4K/60fps video and burst mode stills at 14 fps. This is a huge leap in terms of quality, frame rate and overall image. The Phantom 4 Professional also builds on the original Phantom 4 with additional cameras for obstacle avoidance, upgraded motors and longer flight times. While it looks like a Phantom 4, the Phantom 4 Pro is a big step up and truly lives up to the term “professional”. To summarize the Phantom 4 Professional’s features, all you would have to say is “Yes, it has that!”. What I mean by this is that the Phantom 4 Pro is by far the most advanced quadcopter you can buy for under $2,000. Let’s start with its camera. The Phantom 4 Pro’s camera has been significantly upgraded with a 20-megapixel sensor. This means that each picture and frame of video is taking in more data. The result is clearer, smoother video that avoids the artifacts that you sometime saw in the original Phantom 4 and earlier generations. DJI has also done a lot to make this quadcopter easier to fly with 5 directions of obstacle sensing. Basically, it can see in front with two cameras, downward with a single camera, as well as left/right/back with infrared sensors. Now I won’t tell you that it is crash proof, because no drone is, but it is definitely harder to crash the P4 Pro than any quadcopter I have flown before because of this built-in technology. The remote can either use your existing phone/tablet or can be purchased with an Android-based 5.5 inch 1080p screen that is very bright. The screen is a nice addition for people who want a dedicated piece of hardware and don’t want to tie up their phone or tablet every time they fly. The specifications of the P4 Pro are the area where this quadcopter really shines. It features GPS, a 5870 mAh battery at 15.2 volts, dual band video transmission (2.4 GHz and 5.8 GHz) using Lightbridge to give you a live 720p view of your aircraft with very little latency. 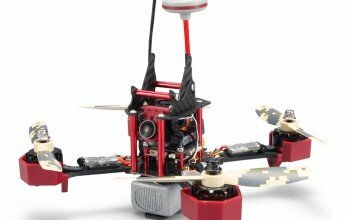 It is 350 millimeters diagonally (excluding the propellers) and comes with a 3-axis gimbal that stabilizes pitch, roll and yaw. The camera is built in and features a 1 inch CMOS sensor that gives it 20 megapixels. The camera can shoot 4K video at 60 frames per second, 2.7K video at 60 frames per second and 1080p video at 120 frames per second! One other big upgrade is that this camera will support a 128-gigabyte micro SD card. Most drones only support up to a 64-gigabyte card, so this doubling of storage means you can shoot a lot more video before you have to reformat the card. Of course, the Phantom 4 Professional uses the DJI Go application which features a variety of customizations and intelligent flight modes. One of my favorites is the new “draw” mode. Draw is a new mode for waypoint control. Simply draw a route on screen and the Phantom 4 Pro will move in that direction while keeping its altitude locked. This allows the pilot to focus on camera control and enables more complex shots. The Phantom 4 Professional looks and feels a lot like the original Phantom 4, which is a good thing. In my opinion, the Phantom 4 was a big leap forward in terms of quality from the Phantom 3 series, which while well built, still felt like a toy to me. The Phantom 4 Professional is the same smooth, shiny white color as the Phantom 4 and can definitely be identified as a DJI Phantom to anyone who knows the line of products. The propellers are the same “push and twist” kind as before and the remote control is almost identical to the original Phantom 4. Everything on this drone is well built, sleek and modern looking. The only couple of small complaints I have about the Phantom 4 Pro in terms of “fit and finish” would be the fact that the battery is still a bit hard to insert and remove from the aircraft. Each time I do it, I have to use more force than I would like. If DJI could come up with a secure, but easier to use locking system for the battery, this would be a big step forward. Also, the touch sensitivity on the included screen (if you buy the “plus” edition) is not great. I’m used to an iPhone, which has amazing touch sensitivity. The included screen is not nearly as smooth. But these are small items and generally, I believe that the quality of build on the Phantom 4 Professional is as good or better than any of DJI’s previous products – which given their track record, is saying a lot! While the DJI Phantom 4 Professional does not require a lot of physica assembly, the set-up is a time consuming and requires about one hour to complete before you are ready to fly. The biggest thing you have to do is download the DJI Go application for your device (iOS or Android) and then configure and update the firmware on your drone. The firmware update takes some time and works best if you are on a fast wifi connection. There are also specific cables that need to be plugged into your quadcopter and transmitter in order to transfer all of the data between your controller and Phantom 4 Pro. Don’t worry, the software takes you through all the steps and while it’s a bit of a tedious process, it is not very difficult to do. Just don’t expect to open the box and fly right away. One other thing that you have to do is configure the software for things like measurement units (imperial or metric), return to home parameters, low battery warning parameters, etc. Most of the default settings in the software are good for beginners and make sense, but it’s a good idea to go through your options and set everything up in the way that makes the most sense to you. And finally, and very importantly, is the compass calibration. This is also documented in the software and leads you through it step by step. While it is a bit of a pain to do the “drone dance” to calibrate the compass, it is very much worth doing! The Phantom 4 Pro is amazing to fly. It is fast, with more powerful brushless motors than the Phantom 4, and it is very precise. The GPS locks it in place with very little movement even in high winds. And the on-board sensors keep it from hitting objects in front, to the side, or below it. The flight characteristics are similar to the Phantom 4 but you can definitely tell a difference in the power of the motors. It has several different flight modes including GPS, attitude, sport and tripod modes. Each flight mode is designed to give you the optimal flight characteristics for different situations. Sport mode is very fast and agile, while tripod mode is very slow and precise. One problem that I have encountered with it is the high center of gravity, which can sometimes lead to it tipping over when it is taking off or landing in windy conditions. But overall, the P4 Pro flies like a dream and is easy for beginners but versatile enough for experts to fly in many different situations. The biggest differentiator of the Phantom 4 Professional is the camera. It is a much better camera than any other in its price range. The 20 megapixel, 1 inch sensor means that you get crisp, sharp images and decent performance in low light. This is still not on par with a DSLR or higher end video camera, but for a moderately priced drone, the images are far better than you might expect. The camera has many settings that you control in the DJI Go application. Things like ISO, aperture, shutter speed and white balance are easily set with the app and make a world of difference to the images when they are set properly. Also, the DJI Go app uses a “tap to focus” feature that means you can get some nice depth of field blurriness behind your subject if you are going for that look. This makes the images and video look much more like a high-end camera and not as flat as drone cameras of the past have looked. The DJI Phantom 4 Professional lives up to its name. It is the culmination of every drone that has come before it and promises to take aerial video and photography to a new level. One consideration before you buy it though is, do you really need it? The DJI Phantom 4, DJI Mavic and the Yuneec Typhoon are all great choices as well, but cost less. The biggest difference is the camera. If you want the best flying camera that you can get for under $2,000, the Phantom 4 Professional is the way to go. But if you are looking for an aerial camera that takes “good” video for recreational use, you might consider buying something a bit less costly. Again, the P4 Professional is aimed at professionals, so if you make your living by producing videos or photography, you can’t go wrong with the P4 Pro!